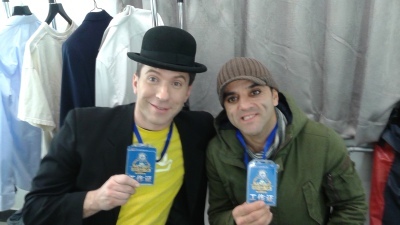 While he was performing in Oklahoma, Brian Spotts was also preparing for a trip to Beijing! This time, he would have to go head-to-head with the current world record holder, Cui Juguo, for the title of Most Eggs Balanced on Needles in One Minute. The competition was fierce, but the preparation was even harder. Who knew it would be that difficult to procure hollow, blunt -tipped needles less than 1.5 millimeters in diameter? And then there was the question of mounting them in was that was perfectly vertical, stable, at the exact height needed.. This isn't a job for an eggbalancer, it's a job for an engineer! So he hired one. It just so happened that Brian's father-in-law, Randy, knew a thing or two about wood and building. He also happened to be available for a trip to Beijing in January, and could afford to come along. 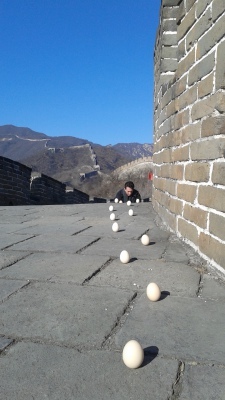 And that is how Brian finally got to balance eggs on the Great Wall of China. 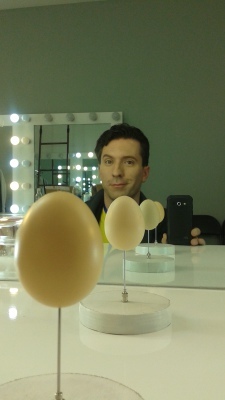 Sure, he didn't break the record for balancing eggs on needles, but neither did the other guy. But he got to check another experience off his bucket list.